I loved Blondie, the late 70’s Punk/New Wave singer but I never really got blondies though. The non chocolatey/white chocolate alternative to brownies. Why would you have a brownie that was not full of rich and unctuous dark chocolate. That is just plain crazy. 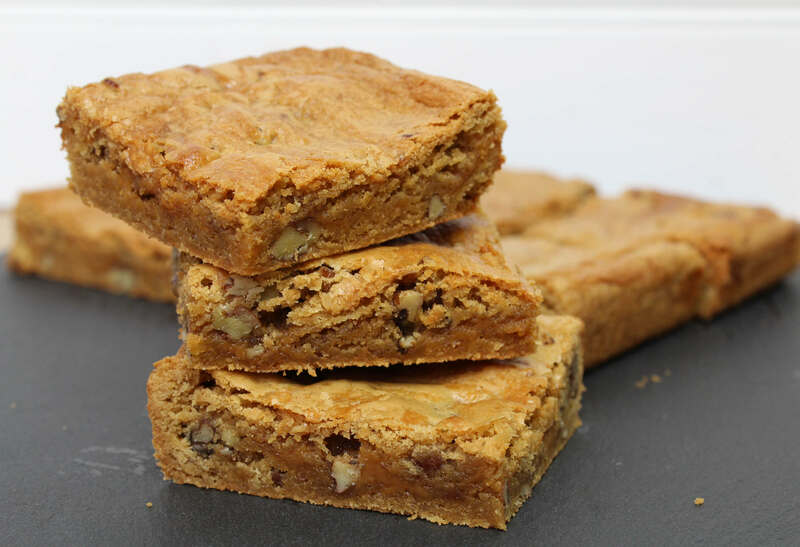 Or at least I thought until a baking and Jenga playing buddy of mine converted me with some fabulous blondies. That set me on a journey to create my own delicious gooey but not too sweet version. I dropped the white chocolate in place of a salted caramel and paired that with my favourite nut, the pecan. Whilst the macadamia may be the king of nuts and the cashew the queen. the pecan is resolutely the prince of nuts in my opinion. The sweetness of the caramel from the brown sugar, set against a lovely salted caramel with the crunch of pecans is tough to beat. I tested it on my guinea pigs, sorry my work colleagues and they were a resounding success. They can be a tough crowed to please. These are amazingly simple to make and will be demolished in seconds. Melt the butter gently in a saucepan along with the oil. Once melted, whisk in the soft brown sugar and vanilla together until combined. Allow to cool for 5 minutes and pour into a mixing bowl. Whisk in the egg and additional egg yolk. Add the flour and baking powder to the wet ingredients and fold in gently until combined. Gently fold in the chopped pecan nuts. Press half of the batter into your tin. Drizzle the salted caramel all over the base and spread in an even layer. Blob the remaining batter over the caramel sauce and gently spread to cover the caramel evenly. Leave to cool in the tin for 30 minutes then remove and cut into 9 squares. Then divide the square in half to make 18 triangles. The heatwave has me in the BBQ spirit and the 4th of July / Independence day is just around the corner. 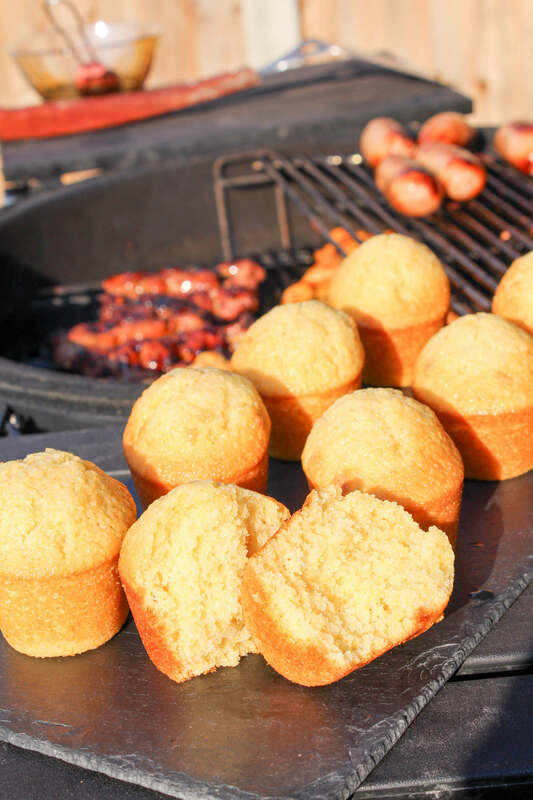 One thing that the boys and I miss from our vacation in Florida last year are the sweet and fluffy cornbread muffins that seemed to accompany any BBQ meal in most restaurants. So I thought I would try and recreate the ultimate delicious little fluffy bundles of joy. My benchmark for success is if my youngest son Ethan gives them the thumbs up. Whilst I do like to add additional flavours to breads and rolls, this base recipe is delicious on its own. Or it can be tweaked with a handful of diced jalapeños and a good grating of your favourite cheese. 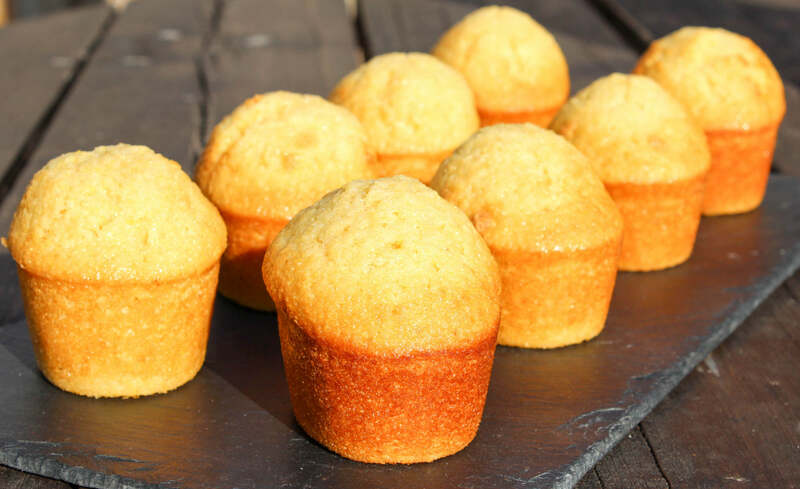 The mix is perfect for a dozen muffin sized cornbreads, they are foolproof and super easy to make. I have tried a few different recipes but the kids voted these the most awesome of the lot. Slathered in some nice cold slightly salted butter, you cannot go wrong. I got a double thumbs up from Ethan. 1. Add flour, cornmeal, sugar, salt and baking powder to a large mixing bowl and mix together. 2. In a separate bowl mix the vegetable oil, eggs and milk. 3. Pour the wet ingredients into the dry ingredients and mix until combined and there are no lumps. 4. Grease a muffin pan and pour the batter into each section until about two thirds full. 5. Bake in a preheated oven at 170c Fan for 18-20 minutes until golden brown. 6. Allow to cool in the pan for a couple of minutes, then remove from the pan and allow to cool on a wire rack. Add flour, cornmeal, sugar, salt and baking powder to a large mixing bowl and mix together. In a separate bowl mix the vegetable oil, eggs and milk. Pour the wet ingredients into the dry ingredients and mix until combined and there are no lumps. Grease a muffin pan and pour the batter into each section until about two thirds full. Bake in a preheated oven at 170c Fan for 18-20 minutes until golden brown. Allow to cool in the pan for a couple of minutes, then remove from the pan and allow to cool on a wire rack. Saturday morning, the last remnants of snow are still lingering in the garden and my eldest son has decided he wants to make some shortbread biscuits all on his own. What a great start to the weekend, we all love shortbread biscuits, especially the dog. A nice big mug of coffee and a warm biscuit sound good to me. It also makes me nostalgic of when I used to bake with my dad as a kid so I was up for a quick bit of baking. 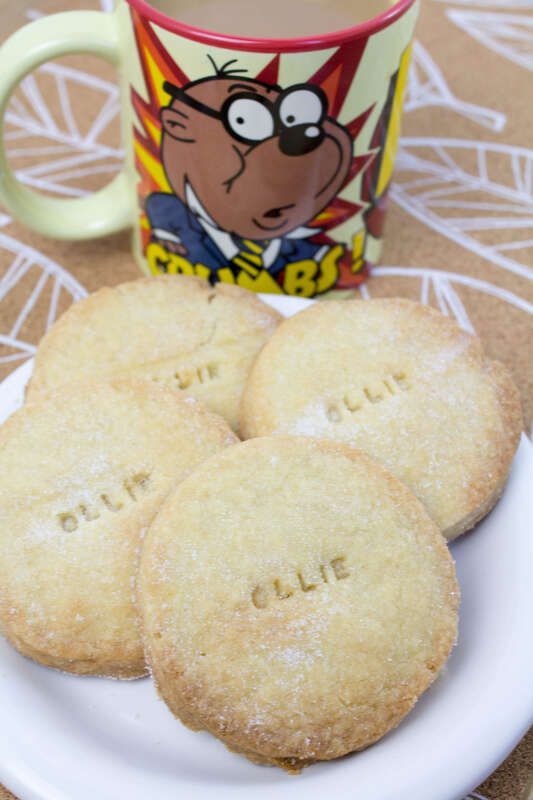 Shortbread biscuits are very easy to make so perfect for the kids to get stuck into. I took on my standard role of “commis chef”, more commonly known as gofer and washer upper. My son pulled out his usual go to shortbread recipe and decided to add some vanilla essence. Good call in my opinion. After directing me to get everything he needed out of the cupboards, he set about making the biscuits (and of course a mess). Anything on the floor becomes the dog’s job to clean up. Which he does with relish. 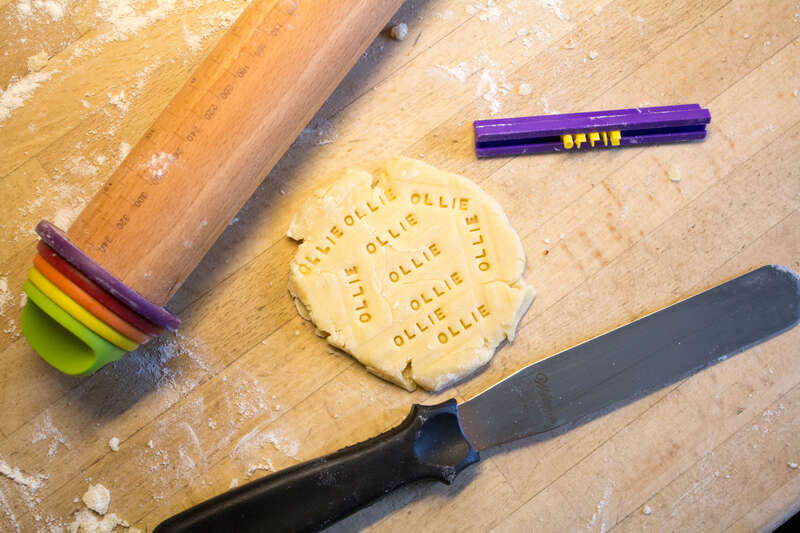 We had also recently bought a cookie letter stamp set, so we thought it a good idea to brand his biscuits with his name as a final flourish. Once the cookies had been cut and stamped and left in the fridge to firm up my son disappeared, more stealthy than a ninja, back to the Xbox and to leave me to clear up the aftermath. That’s my boy, I used to do that to my dad but back in the day it would have been a Gameboy. Once baked, the “Hillery” baking judges, Ethan (7), Ann my wife, Chester the Cockerpoo and Oliver all dug in. The verdict must have been good, as by the time I had made a cup of coffee they were nearly gone. Oh well, maybe next weekend I will get a look in. Beat the butter, sugar and vanilla essence together with a wooden spoon until smooth. Stir in the flour and mix together to bring all the ingredients together. Try not to overwork. Turn on to a lightly floured work surface and gently roll out to about 1 cm thick. 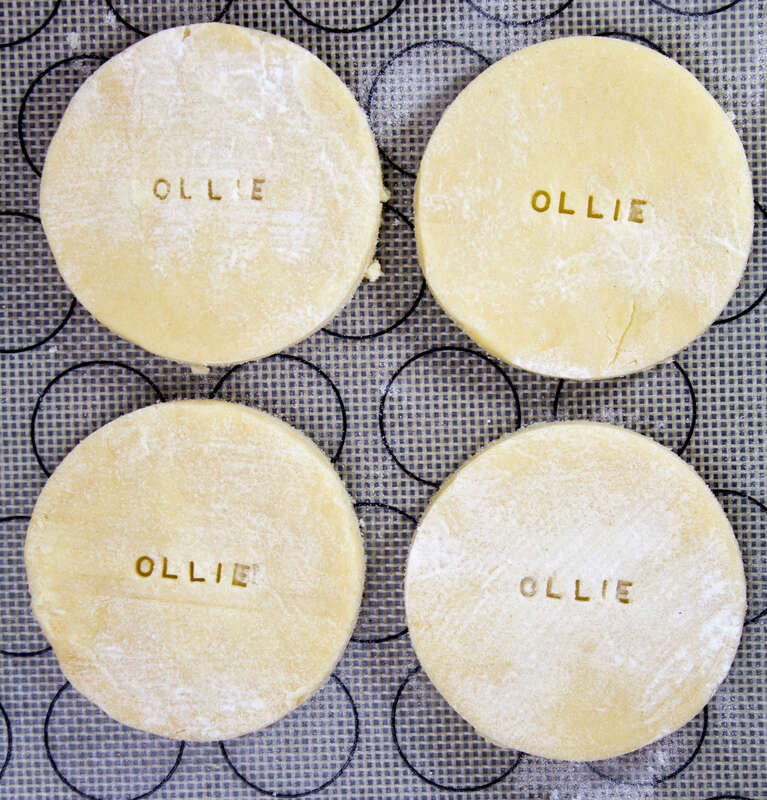 Cut out with a cookie cutter and place onto a baking tray. Roll together any spare dough and repeat. Sprinkle with caster sugar and place in the fridge for 20-30 minutes to chill the dough. This will help prevent spreading. Bake in the oven for 15-20 minutes until pale golden-brown. Let cool for a couple of minutes on the baking tray. Then transfer to a cooling rack to finish cooling. While the wife’s away the kids will play. This weekend has been a boys weekend in my house, with the wife popping away to catch up with some old school friends. Which left me and my two boys alone for the weekend to get up to mischief. On Saturday morning we decided to pop to the local farm shop’s new cafe to sample their breakfasts. As usual at any coffee shop we go to the boys will sniff out the gingerbread men. The farm shop was full of pumpkins as Halloween is just around the corner. 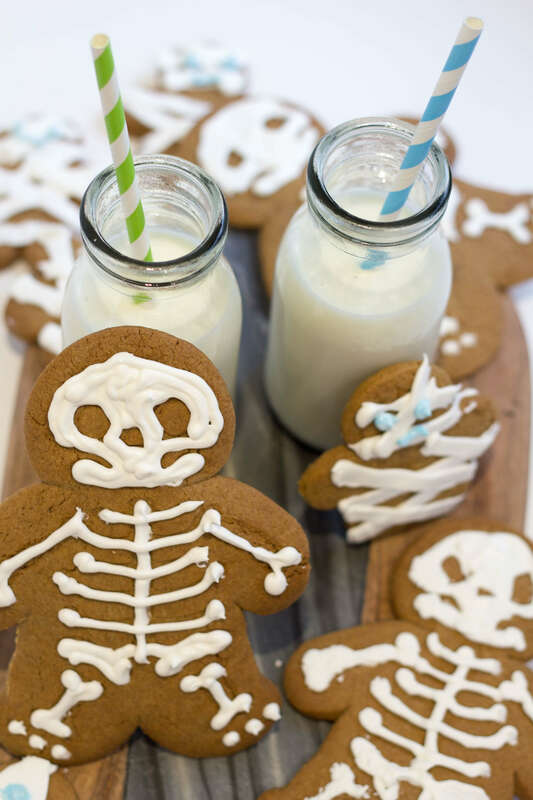 That gave me the idea to dust off my favourite gingerbread man recipe and do some baking with the boys. Skeletons and mummies were on the cards. 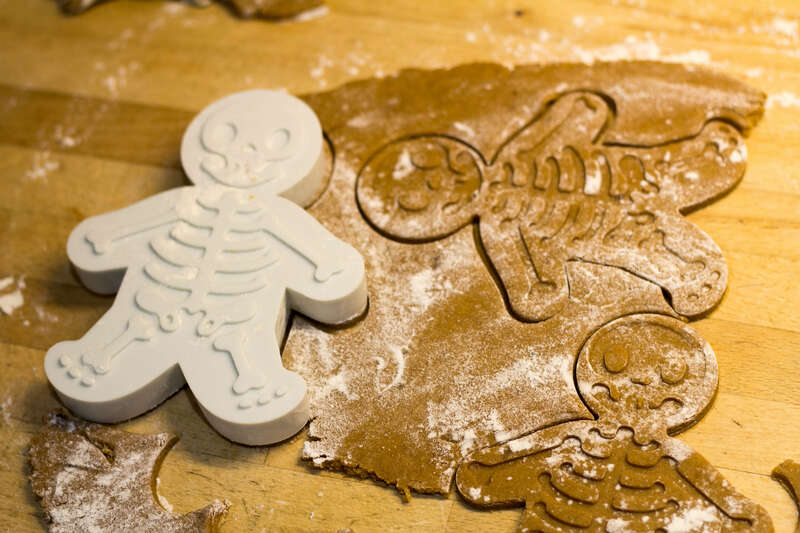 I have a great skeleton cutter that I have not had a chance to use yet that imprints a skeleton onto the dough so you can fill the impression with icing. Unfortunately the definition was slightly lost as the biscuits cooked but it did give me a guide for my first attempt at piping royal icing. The smaller mummies I just free handed with a small flat piping nozzle. 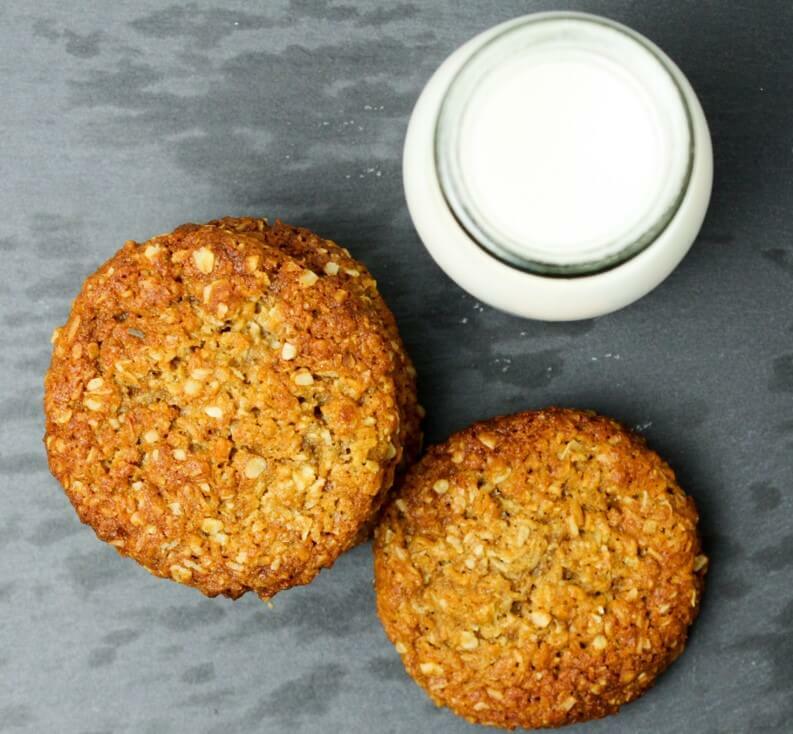 This recipe uses golden syrup rather than treacle so makes a slightly lighter coloured gingerbread but it has a good kick of ginger and cinnamon to make a lovely, warming biscuit. Sift together the all of the dry ingredients into the bowl of a food processor. Add the butter and whizz until the mix looks like fine breadcrumbs. Add in the sugar and whizz again just to incorporate. Beat the egg and golden syrup together, add to the food processor and whizz until the mixture starts to come together. Tip the dough out onto a lightly floured surface and knead until smooth, wrap in cling film and leave to chill in the fridge for 15 minutes. Preheat the oven to 180C. Line two baking trays with grease-proof paper. Roll the dough out to about half a centimetre thickness on a lightly floured surface. Using gingerbread men cookie cutters, cut out and place on the baking tray, leaving a gap between them. Leave on the tray for 10 minutes to cool slightly, then move to a wire rack to finish cooling. 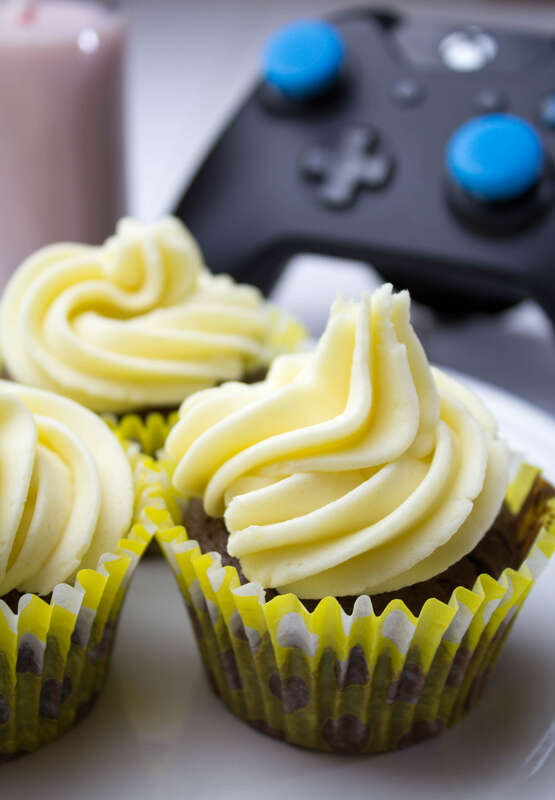 To make the icing add the royal icing sugar, vanilla extract and 40ml of water to the bowl of a mixer with the whisk attachment or you can use an electric whisk. Before whisking mix together with a spoon or spatula. This will prevent a icing sugar cloud when you start mixing. Whisk for a couple of minutes until thick, if too thick to pipe, loosen with an additional teaspoon or two of water. Put into a piping bag.When cooled decorate with the icing. Adapted from a GoodFood recipe. 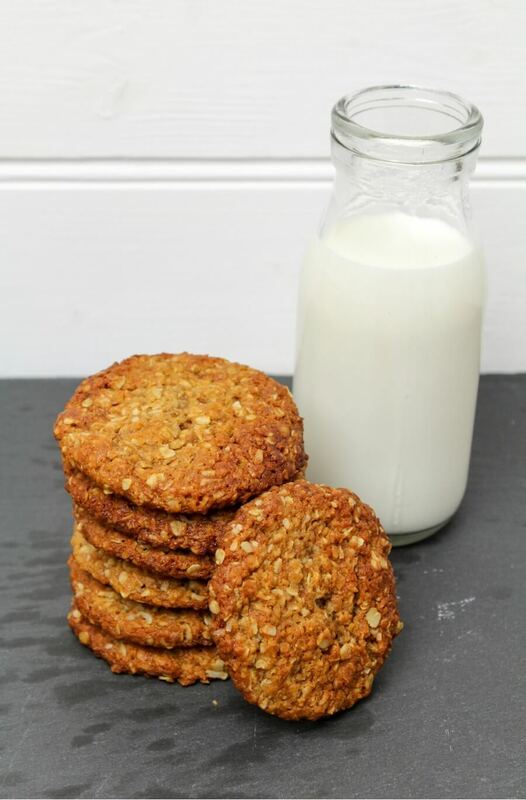 A lighter coloured gingerbread but it has a good kick of ginger and cinnamon to make a lovely, warming biscuit. I do love creating a twist on a simple recipe. A basic sugar cookie is super simple to make, delicious, sweet and chewy and the options of what you can add to it are limited only by your imagination. The sugar cookie is the go to basic cookie of America. 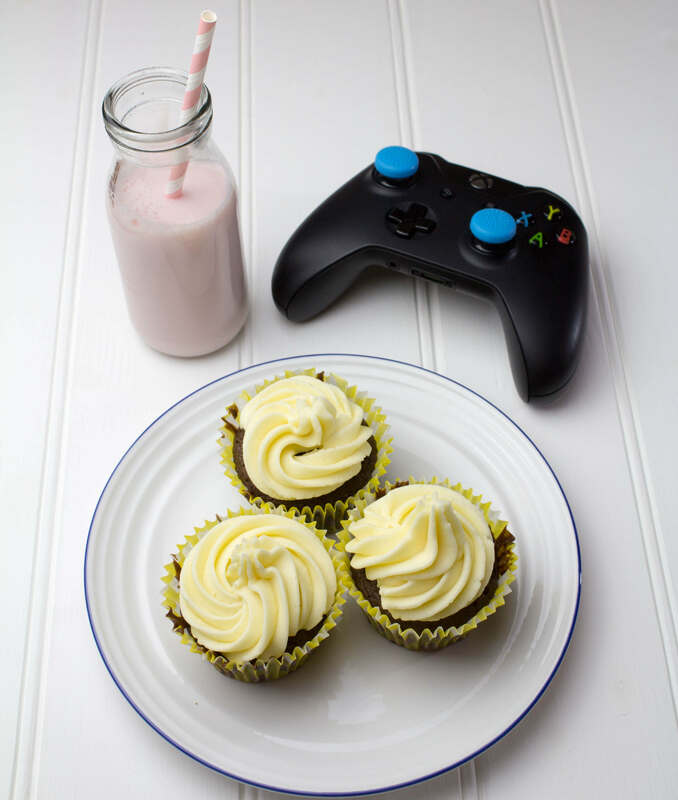 I discovered them when I was fortunate to have the opportunity to live and work in Chicago as an expat and I came across the endearing passion that the Americans have for baking. I came back with a big book of “family” recipes from my co workers and over time they will work their way to this blog. Verena’s lemon bars are a delight and not to be missed. These sugar cookies are a great staple to have in your repertoire and fantastic with an espresso to cut through the sweetness. For the UK pallet they can seem a bit sweet but the kids love them. I normally make a large batch and split the dough in two. One half for the kids and one half for the parents. The boys favourite is stuffed to the brim with Smarties or chocolate M & M’s. Whilst for the adults I love freeze dried strawberry or raspberry pieces. 1. Preheat oven to 325F/170C. Line 3 cookie sheets with parchment paper or a silicon nonstick baking mat. 2. In a mixer with a paddle attachment or with a wooden spoon, cream together butter and caster sugar until pale, light and fluffy, Incorporate the egg and vanilla extract and mix until ­combined. 3. Mix in the dry ingredients; flour, baking powder and salt until combined. Do not over mix or the cookie will get tough. 4. At this stage add any additional ingredients such as choc chips, smarties or freeze dried fruit and mix until evenly distributed. 5. Scoop cookie dough into balls about the size of a walnut. 6. Place each ball of cookie dough onto the baking sheet lining. Leave an inch or two between each one for spreading and gently flatten slightly. 7. Bake for about 8 – 10 mins until lightly golden brown. Preheat oven to 325F/170C. Line 3 cookie sheets with parchment paper or a silicon nonstick baking mat. In a mixer with a paddle attachment or with a wooden spoon, cream together butter and caster sugar until pale, light and fluffy, Incorporate the egg and vanilla extract and mix until ­combined. Mix in the dry ingredients; flour, baking powder and salt until combined. Do not over mix or the cookie will get tough. 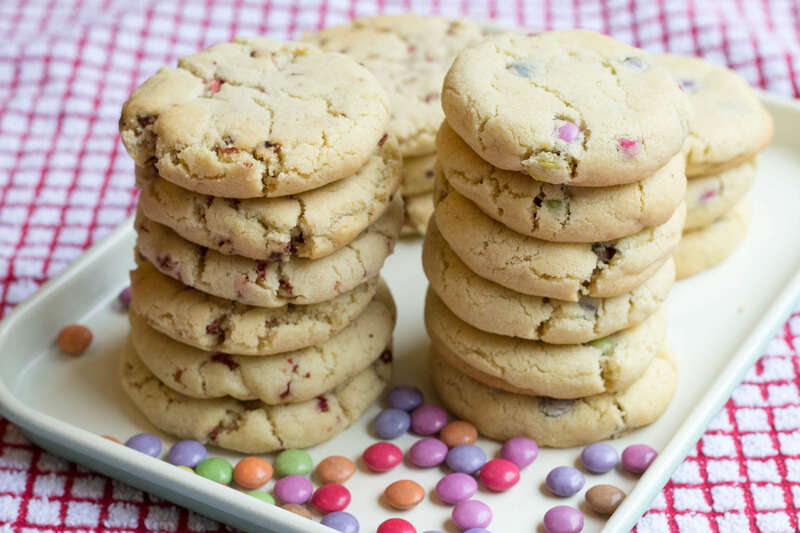 At this stage add any additional ingredients such as choc chips, smarties or freeze dried fruit and mix until evenly distributed. Scoop cookie dough into balls about the size of a walnut. 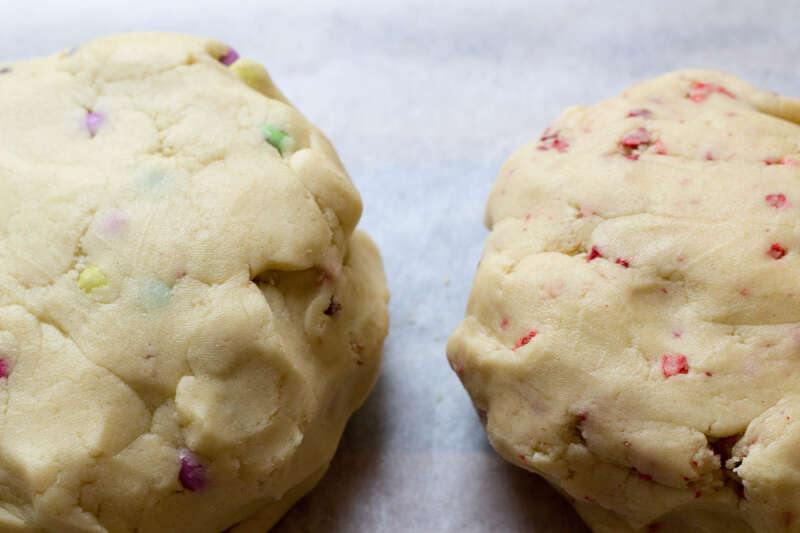 Place each ball of cookie dough onto the baking sheet lining. Leave an inch or two between each one for spreading and gently flatten slightly. Bake for about 8 - 10 mins until lightly golden brown.